Residents are blaming the newer and heavier 7000 series Metro railcars for shaking their homes. News4's Adam Tuss reports. 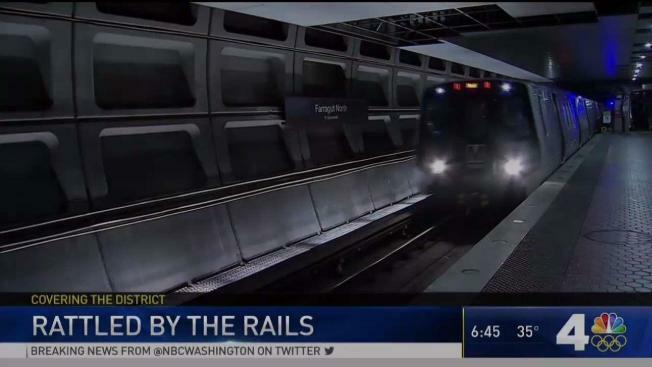 Residents in some Washington, D.C., neighborhoods said Metro trains are rumbling through their neighborhoods so loudly that their homes are shaking. While they are blaming the newer and heavier 7000 series railcars, Metro said those cars are not the only ones creating a vibrational issue. Residents close to the Georgia Avenue station have been complaining to the transit agency about the issue. Metro said four out of the 10 homes they took a look in the Petworth neighborhood do show increased vibrational levels. The new railcars are built with heavy steel and weigh about 2,000 pounds more than their older counterparts. Louise Smith, a resident in Petworth for more than 50 years, said the new trains are having an effect on her home. "See the floor? Nothing doing this but the underground,” Smith said. “When that train shakes, it's just like that earthquake here." Smith said pictures have fallen from her walls, and the glass frames have been busted. Metro is still putting together a final report, but a recent letter from Metro general manager Paul Wiedefeld said some newer model trains are increasing vibration levels above Metro standards. However, Wiedefeld said higher vibration levels are coming in above standards with older model trains as well, and none of the vibrations are enough to cause any structural damage. A final report on this is scheduled for early next year.